Home Cloud Computing - What it is and How it works? Internet has become the fantastic gift for enterprises. As you know, businesses working online have become common these days. Also, along with this, the development and maintenance of businesses are done online. Specific companies are involved in providing infrastructure and software such approach working through internet and intended for improving business services to various enterprises throughout the world with the help of Internet. Cloud computing is one efficiency. Remember cloud computing is not a technology – it is a phenomenon that promises to convert business capabilities around the world. Earlier, in the absence of cloud computing, it was required for big businesses to buy, construct and maintain expensive information management technology and infrastructure. Experts are required to install, develop, test, run, manage, secure and update the infrastructure and it requires multiple efforts. This invests a lot of time, resources and cost too. However, cloud computing solutions have put an end to such critical problems for all businesses. Now instead of investing huge amounts in such servers, cloud computing allows them to simply rely on workstations allowing fast internet connections. Therefore, cloud computing is considered to be a cost-saving potential for enterprises irrespective of their size. Now let’s know about various details of cloud computing such as definition, how it works, its models and types, advantages and so on. Cloud computing is the practice for storage and delivery of hosted services such as storage, management, and processing of data online. Imagine, Internet as a virtual space that is connecting users all over the world - cloud computing is acting like a cloud that helps in sharing information through satellite networks. Hence, the term 'cloud' came into existence. Compute resources such as a virtual machine, an application, or a storage means can be consumed by companies through cloud computing instead of building and maintaining such infrastructure by themselves. As it is very much economical, many businesses of a wide range of industries across the world have been using cloud computing. How does 'the Cloud' work? As said, cloud computing serves as a platform for service-oriented architecture and delivers software and data. The term cloud can be referred to a grid of computers which work through internet. Let's divide the cloud computing into two sections - the front end and the back end - in order to understand how the cloud works. The computer user or client is referred as the front end and the cloud section is referred as the back end. The front end constitutes specific network and application required for the access of the cloud computing system. The cloud constitutes different computers, servers and data storage systems. It can also include computer programs, data processing systems and video games. The cloud can, therefore, include an application, platform or an infrastructure. Based on the need, the cloud can share them to the clients. So cloud computing is considered to be of three types. It is a model in which software is distributed by a third-party provider which hosts the applications. Also, they are made available to the customers over the internet. It is meant for monitoring, content, communication (email), finance, CRM and collaborative services. Salesforce, NetSuite and Concur are some of the examples of SaaS cloud computing providers. - This includes sharing of a platform for application development, decision support, web, and streaming. Constituents like object storage, queue, database, runtime and identity are related to this type of cloud computing. These considerations are made available to the customers over the internet. AWS Elastic Beanstalk, Heroku and Google App Engine are some of the examples of PaaS cloud computing providers. Servers, virtualized and storage resources are shared over the internet through this model. Services such as caching, legacy, files, networking, technical concerns, security and system management are included in this type of computing. Google Compute Engine, Microsoft Azure and Amazon Web Services (AWS) are some of the examples of IaaS cloud computing providers. 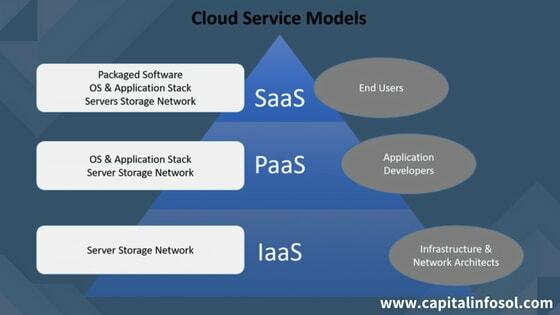 Also, there are three different models of cloud computing deployment. They are private, hybrid and public. When an enterprise uses its architecture through cloud servers limited to its own center for internal users, it is considered as a private cloud model. On-premises hardware, single-tenant architecture and direct control of the cloud infrastructure are the basic characteristics of this model. VMware, OpenStack, Microsoft, Red Hat, IBM, Dell EMC and HPE are the popular vendors of private cloud computing. When the cloud services are delivered through the internet to public by a third-party cloud service provider, it is considered as a public cloud model. Its main characteristics are multi-tenant architecture and pay-as-you-go pricing model. Some of the popular public cloud computing providers include AWS, IBM, Google Cloud Platform, and Microsoft Azure. When the cloud services are delivered through a combination of both public and private models, then it is considered as a hybrid cloud model. It is a blend of the above two cloud services with proper coordination between the two platforms. Its characteristics include cloud bursting capabilities, and benefits for public as well as private environments. The vendors of public as well as private cloud providers come under the popular hybrid cloud providers. Various cloud-based applications have arisen today for successful run of businesses. They are related to Customer Relationship Management (CRM Cloud), marketing (Marketing Cloud), sales (Sales Cloud), HR, accounting and many others. Here are some basic applications on how companies can use cloud computing technology. IaaS and PaaS - As you know, companies are now relying on IaaS services from the cloud providers. It enables the companies to use the infrastructure related services on a pay-per-use basis. Similarly, a simple ready-to-use platform for development cycle has been offered by the providers to improve business efficiency. Big Data Analytics- Dealing with big data analytics is the primary and basic duty of large businesses. Identifying structured and unstructured data and using the right data is very much critical. However, this has become easy with cloud computing technology. Businesses can get the required values from the services offered by the respective cloud providers through their customized services. Test and Development- As said, instead of wasting time and resources in testing and developing codes, cloud computing with better environment offer all the desired applications in no time. File Storage- Multi-tenant system of cloud architecture helps businesses to store files and big data in safe and secure way. However, the payment for such considerations is done as per the amount of storage that is put into the cloud. Backup- Running out of backup media is one of the critical issues for businesses. Also, they also need more time to load the backup devices and perform restore operations. But, cloud computing offers the best backup services without any compromise on security, availability and capacity. As you got to know about how the cloud works and its applications in businesses, let's see what its benefits and risks are. Cloud computing technique allows worldwide access, easy set-up, more storage, elasticity, workload resilience, automatic updates and many other beneficial applications. Worldwide Access: With cloud computing, it is possible to access the documents from any device in any corner of the world. For instance, it allows business men to work from home or any other business trips, thereby increasing productivity. Easy Set-up: It is simple to adjust individual settings such as choosing a device to connect to network and set up a password. With easy steps, it allows one to start using the software, information or resources within no time. More Storage: Cloud computing models offer more storage capacity and avoid the concerns of low storage and back-up abilities. When the companies are interested to upload documents, videos and data to the cloud and retrieving them as per convenience, storage space on the desktop or laptops is saved. Elasticity: Based on the requirements, companies can scale up and scale down the cloud computing services. With this, it is possible to avoid company's huge investments in local infrastructure. Multi-tenant: Each customer that uses the cloud is termed as a tenant. So, cloud computing allows a multi-tenant system in which multiple customers are served by a single instance of software applications. Furthermore, some parts of the applications can be customized and given to the customers if needed. This architecture, therefore, is found to be economical for companies as the maintenance and developments costs are shared. Workload Resilience: While important workloads of the users are running across multiple regions of the world, cloud computing ensures that they are stored resiliently and hence are remained safe. 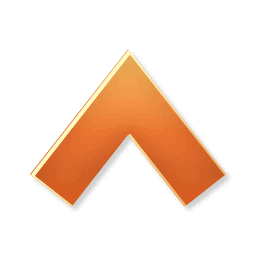 Automatic Updates: Automatic updates in case of the services are provided by the cloud providers. It's just simple to follow those updates, download and continue the service you need. The instructions will be given by the provider automatically and it's not necessary for one to take any expert's advice. Reduced Costs: Various cloud computing providers offer the services that are inexpensive. Some applications such as Dropbox are even free. While others for which you need to pay are affordable too. It's possible to continue the service on monthly and yearly payments. Also, you can choose a plan without contract and terminate the services any time - it enables you to pay for only the services you used (Pay-per-use). Microsoft Azure, Google Cloud platform and AWS are some of the cloud providers which offer pay-per-use model as per pricing considerations. Based upon the business needs, a company should opt the right choice of cloud computing service from the right provider. This enables one to make an organization efficient and successful in all ways. With its scalability, affordability, security and virtual nature, cloud computing excels itself in ensuring a productive and profitable business. Three categories of professionals are included in cloud computing. They are IT architects involved in designing main solutions, IT administrators involved in maintaining service provider infrastructure and IT consultants involved in assessing clients’ needs. 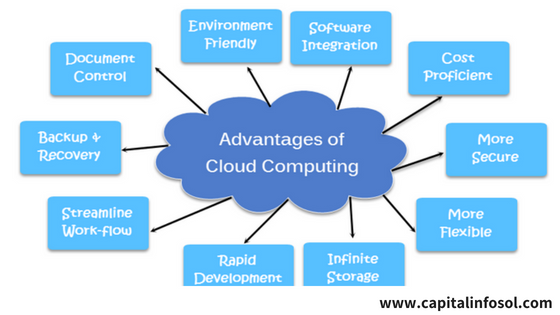 So, it is very much essential for them to know each and every aspect related to cloud computing. It has, therefore, become priority for the employers to hire those having certifications related to cloud computing. So, if you are ready to start your career in this field, better start cloud computing training from Capital Info Solutions which is the right training institute offering training with certifications from experts and professionals. Online, offline and corporate training facilities are available here. So, choose an option as per your time and be ready to receive excellent future ahead.